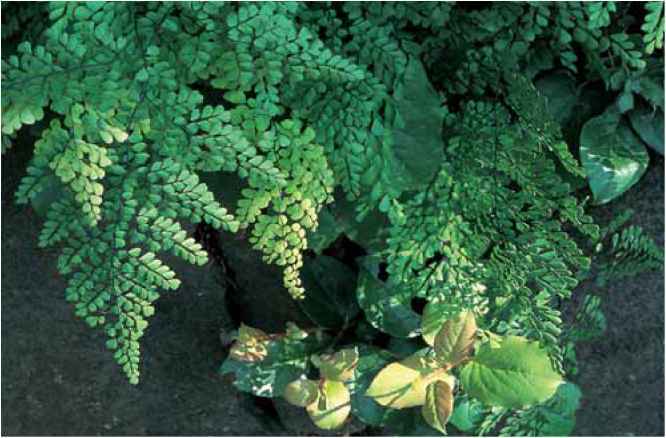 Adiantum aethiopicum (from Ethiopia, which is questionable), common maidenhair, is native from Africa to New Zealand and Australia. 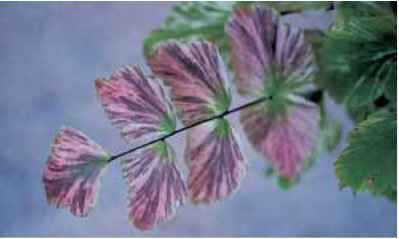 It brings a typical maidenhair tracery of triangular sprays of pinnules on fronds that range from 1 to 2 ft. (30 to 60 cm) in height. In nature it wanders about, is readily established, and endures with ease in moist to dryish, lightly shaded sites. It is occasionally recommended for gardens in Zone 8, but will not tolerate, or survive, winter temperatures much below freezing (and certainly not for long.) This is, however, one of the easier maidenhairs for outdoor gardens in Zones 9 to 11. 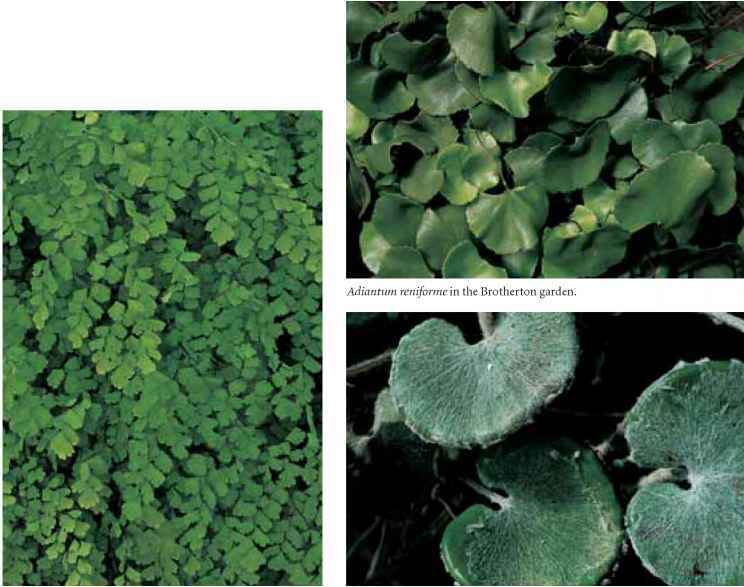 Elsewhere, for budding maidenhair enthusiasts, it is an excellent option for testing growers and their indoor sites for maidenhair compatibility. Adiantum venustum in the Bradner garden. ally fading to soft green. This tropical species is best displayed in warm and humid ferneries (but is happily established outdoors in Southern California) and is especially impressive when the rooting plantlets are encouraged to encircle hanging baskets. A recent introduction from the mountains of China is reputed to be more cold tolerant, offering potential for gardeners in Zones 7b and 8. Apogamous. Adiantum davidii (after Father Armand David, 1826-1900) from China (where web searches translate the common name as "pig long neck hair grass") and Tibet has triangular, 6- to 12-in. (15- to 30-cm) bipinnate fronds on a blue-black wiry structure. The pinnules are undulate wedges of soft green with spine-tipped terminal margins. Sori with inrolled, kidney-shaped false indusia are connected in pairs at the apex of each pinnule. The species, evergreen in warmer areas and deciduous in cold regions, is similar to A. venustum and distinguished by the more incised pinnule margins. It is cultivated in Zone 6 gardens in Germany as well as warmer gardens in England. When available, it should be an instant success with fern growers in the United States, especially the dedicated specialists looking to expand their hardy maidenhair collections in Zones 6 to 9. Adiantum formosum and Collospermum hastatum with its 1-ft. (30-cm) racemes. Photo by George Schenk. Adiantum caudatum in the Southern California garden of David Schwartz. Photo by David Schwartz. New growth on Adiantum japonicum. Adiantum macrophyllum at Henry's Plant Farm. Adiantum macrophyllum 'Variegatum' in the Piedra garden. classifies it as A. pedatum but notes that the Asian material is different from that of North America. 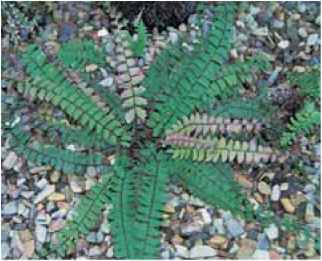 The fan-shaped frond is similar to both species. Like A. pedatum, however, the new growth is colorful although a much warmer reddish orange. With a height of 1 ft. (30 cm), it is shorter than both near relatives. The lower hardiness range is Zone 6. By whatever moniker, it is a beautiful addition to a shade garden. 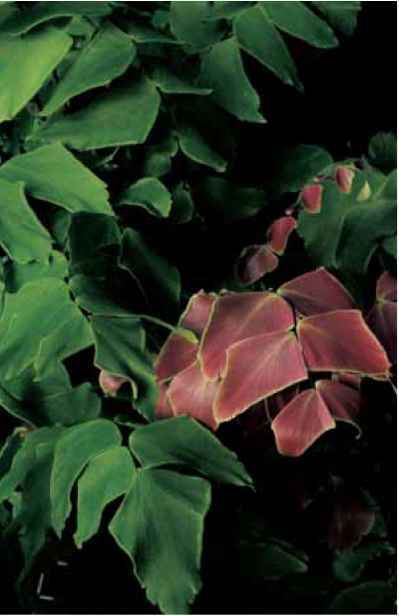 Adiantum macrophyllum (large leaved) is indeed large leaved with impressive, once-pinnate, 2-ft. (60-cm) fronds bearing tissue-thin bursts of rosy red, 2-in. (5-cm) triangular pinnae. The species is noted for the uninterrupted, elongate linear sori that trim the upper and lower pinnae edges but do not extend to the apices. It prefers basic, well-drained soil in tropical surroundings. Encourage it with warmth and kindness, but do not overwater or overpot. 'Variegatum', a variegated form with soft pastel tones of rose, green, and ivory, is occasionally available and deserves to be a cherished addition to the displays of the skilled grower. Adiantum xmairisii (after Mairis of the British nursery Mairis and Company), Mairis's hybrid maidenhair, is an old-timer having been named before 1885. One parent is presumed to be A. capillus-veneris while the other is variously listed as A. raddianum (synonym A. cuneatum) or A. aethiopicum (Rush 1984). It is a rarely available, bipinnate, deciduous, sterile hybrid that reaches 15 in. (38 cm) and resembles an erect A. capillus-veneris. Given the parentage, it is surprisingly hardy and spreads about energetically amid the shelter and warmth of rocks in British gardens. It should be suitable in sites in Zone 8 and certainly at ease, and possibly evergreen, in Zone 9. Mickel (1994) notes that it can be coaxed into cultivation in colder climates when nestled against a damp shady wall. Propagation is by division. Adiantum ogasawarense(from Ogasawara Island, Japan) is very similar in outline to A. capillus-veneris but far more difficult to cultivate. It has rounded rather than fan-shaped pinnules. The bipinnate, evergreen, foot-long (30-cm) fronds are ovate with soft green, imbricate pinnae on a blackish skeletal structure. The plant prefers exposed rocky sites and is an endangered species in its homeland. Having briefly made an unsuccessful appearance in the U.S. trade, it is also "endangered" in cultivation. Give it lean rocky soil with excellent drainage and bright filtered light in Zones 8 (heavily protected) to 10. Adiantum peruvianum (of Peru), the silver dollar fern, is a native of tropical South American rain forests where it is reputed to be a bit of a weed. (We should be so lucky.) In the comfort of its natural surroundings, the bipinnate to tripin-nate fronds can reach 3 ft. (90 cm) with asymmetrical diamond-shaped, 2-in. (5-cm) pinnules that are "silvery" in appearance, and a metallic rose in new growth. The pinnules are edged on two sides with multiple scallops of sori enclosed by inrolled marginal segments. When grown indoors this extremely appealing species must have consistently humid conditions for optimal health, impact, and long-term survival, but it survives surprisingly well outdoors in the dryish regions of Southern California. A well-grown specimen is truly a visual delight. Adiantum reniforme (kidney-shaped) is a marvel of overlapping kelly-green pinnae looking like miniature, leather lily pads, and completely distinct from the stereotypical feathery appearance traditionally associated with maidenhairs. The 2-in. (5-cm) pinnae are totally bordered by fertile marginal segments and supported by hairy wires of dark brown stipes. The whole mass matures at a flat-topped 6 to 12 in. (15 to 30 cm). It is native to surprisingly exposed sites. My late husband, Harry, and I were amazed and delighted to discover cascades of fronds perched high above the waterfall at trail's end on the popular Canary Island hike into the Baranco del Infierno (less poetically, Hell's Gorge) on Tenerife. The substrate is lime and that is the recommended planting medium, along with porous soil, for keeping this conversation piece in good health. It is for dedicated specialists in Zones 9 and 10 or tempered indoor sites elsewhere. 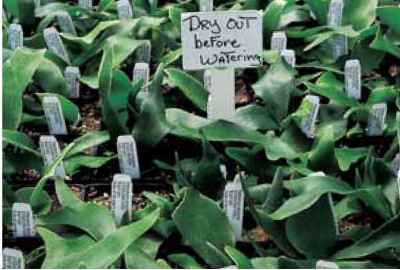 Goudey (1985) recommends cultivating it in terra cotta pots to encourage good drainage and aeration of the root system. Adiantum asarifolium (synonym A. reniforme var. asarifolium) is a bizarre hairy version with thick black margins, larger sori, and recurved lower frond portions that sometimes overlap the stipe. It is definitely a plant of interest. Adiantum tenerum (delicate, tender), brittle maidenhair, is native to New World tropics from Florida and the Caribbean south to Brazil along with an unexplained presence in Hawaii. Adiantum tenerum 'Farleyense' at Henry's Plant Farm. Adiantum asarifolium in the Brotherton garden. conditions, it can reach 3 ft. (90 cm), but is more likely to form a 2-ft. (60-cm), shrubby fountain of arching and drooping foliage. 'Sleeping Beauty' is periodically available in the florist or indoor fern trade and has "sleeping," lax pinnules. The fronds, however, are more erect in habit than many of the other tender cultivars. 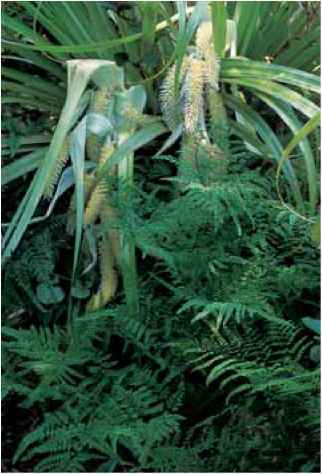 The 2-ft. (60-cm), triangular fronds are bipinnate to quadripinnate, with substantial rather than feathery pinnules. New growth can be an attractive warm rosy red. 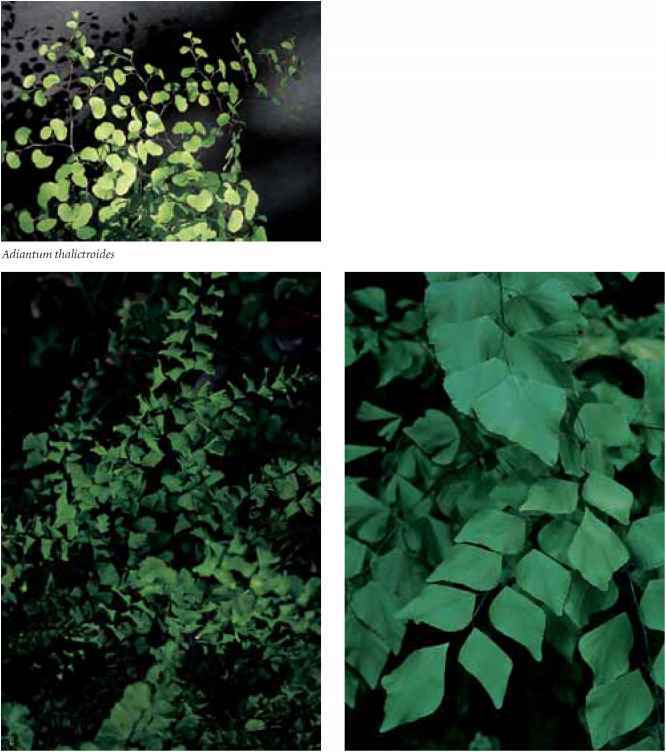 Adiantum thalictroides (like Thalictrum, meadow rue) is an attractive new introduction to North American horticulture from higher elevations above Buenos Aires. 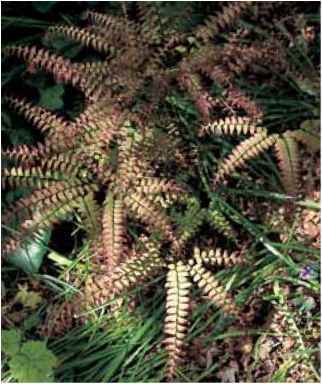 The drooping 2-ft. (60-cm) fronds have the traditional dark stems and are slightly dusted with a whitish/yellowish powder. The dainty pinnules look like miniature baseball mitts. This species is suitable for Zones 8 and 9, and with caution 7b, in light woodland soil. Adiantum xtracyi (after Joseph Tracy who collected a specimen in California in 1924) is the rare sterile hybrid between A. aleuticum and A. jordanii found in Oregon and California where the parental ranges overlap. It has a loosely triangular, evergreen 1-ft. (30-cm) frond with divided basal pinnae tapering to a once-divided tip. A handsome novelty, it is much easier to cultivate and more vigorous than A. jordanii. Grow it in Zones 7 to 9 in moist soil and light shade. Adiantum trapeziforme (four-sided) is a tall-growing tropical that can reach 6 ft. (2 m) in the wild and must be quite a sight. The shallowly lobed, papery pinnules terminate in an elongated point and carry a pair of oblong sori on each lobe. The species needs warm and humid conditions. having arching to erect fronds of 11/2 to 21/2 ft. (45 to 75 cm) and fan-shaped to funnel-shaped blades. East Coast growers, however, report that once away from serpentine the structure is like that of a small A. pedatum. 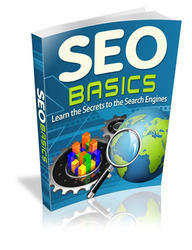 Increase Your Profitability Through Powerful SEO Secrets. Search Engine Optimization SEO Strategy is the Most Effective Means by Which You Can Get More Quality Visitors to Your Website in Order to Successfully Improve Sales and Expand Your Customer Base.